Like the Lock Ness monster, summer is the usual time for sightings, but until now there had been no known appearances this year by the 'mythical' Yeti in eastern Russia. 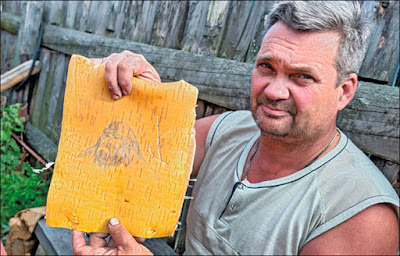 This has changed with well-known Tashtagol artist and sculptor Andrey Lyubchenko's claim that he came face to face with an Abominable Snowman less than a month ago. What's more the Yeti posed for him - allowing the artist to draw his picture on birch bark - and the pair even managed to 'speak', he claimed. 'It happened so unexpectedly and fast that I had no time to get scared,' he said. 'There was a clear feeling that this was a thinking creature, I felt he was trying to 'talk' to me. At the time he was in the remote taiga in Kemerovo region, well known as the Russian region with the most Yeti sightings. 'It was in the morning of 27 July, I went in into taiga to gather materials for wooden sculptures,' he said. 'I usually need a lot of curved and unusually shaped branches. I live right next to the edge of taiga, so I left early in the morning. It was 5 am, I was getting close to Chernukha mountain, which is right next to the Tashtagol TV must. This is suggests his feet were 46 cm in length - or 18 inches. After the encounter he sought a person who spoke the local Siberian Shor language and asked about a meaning of the word, without explaining where and how he heard it. 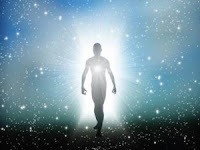 He told that there can be several translations, one meaning 'a sole', and another one meaning 'the one that wasn't discovered'. 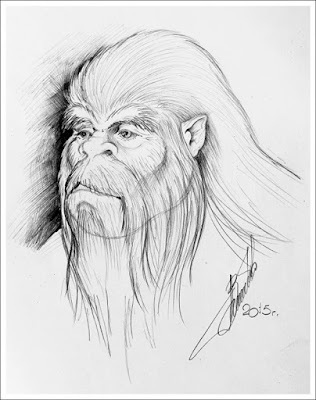 The artist said he was 'talking' to the Yeti for about 40 minutes. He admitted he could not prove his encounter, and that he was previously pre-disposed to believe in the existence of the Yeti, factors which are in common with many supposed sightings. 'I didn't have my phone with camera on me, or a camera - but I always carry a pencil and something I can draw on, this time it was a piece of birch tree bark,' he said. 'I made a drawing of the Yeti and showed him. The Yeti studied it really carefully for a while, and then drew a symbol next to my drawing. If Yetis live so close to people, he was asked by Natalya Guzeva, a journalist from 'Kuzbass 85' newspaper, why they did not show themselves more to humans. 'I wonder if they are scared to intervene. Do you think it was easy to put up with this meeting? I am still in a state of shock, I can't believe it happened to me,' he said. Why was he chosen by the Yeti? 'I guess it was a pure coincidence. Or perhaps it happened because I sincerely believed in Yeti's existence and imagined how one day I'd meet them. I've been dreaming about meeting them, to be honest. I also don't think that I am the only person that met Yeti. Others simply don't speak about it, rightly fearing they might be called insane. The newspaper said it has asked about him and 'he is a reputable person in the city, quite well-known, and certainly isn't seen as a nutter'. Russia's best known Yeti hunter Igor Burtsev - head of the Russian International Centre of Hominology - has previously estimated that as many as 30 Yetis roam Kemerovo region. 'We are on the brink of finding the Yeti at long last,' he said in 2011. A hiker has captured the image of a strange figure while out walking near a Toowoomba water hole. Brokc David had been out walking in the Australian wilderness recently when he was overcome by a sudden sense of dread and an overwhelming feeling that he was being watched. When he later went through the photographs he'd taken he noticed one that seemed to show a bearded man dressed in red peering out at him from behind a pile of roots and branches. "I felt like the hairs on the back of my neck were standing up, I honestly don't believe in ghosts or anything supernatural," he said. "Oddly enough I've been experiencing a similar feeling of dread every once in a while over the last week." The eerie photograph has since proven quite popular on social media with some Internet users even claiming to have experienced a similar sense of unease just from looking at it. Whether the picture shows anything genuinely paranormal however remains a matter of debate. Sean and Lon are joined by JC Johnson and Jules Godwin of Crypto Four Corners, Roy Clark, and Steve Stockton to discuss their strange stories. 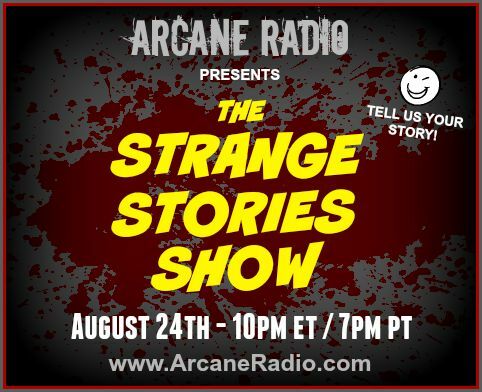 This is the first episode in a new featured series, Arcane Radio: The Strange Stories. Recorded Live on Monday August 24, 2015.